Revolution Nutrition™ Bull Dose Rush is the real next generation of pre-workout formulas! Scientifically engineered to produce the maximum muscle pumps while also supplying incomparable intensity and focus! Formulated with Citrulline Malate and Agmatine, Bull Dose Rush gives you muscle pumps and vascularity like never before! Bull Dose Rush also contains powerful stimulants like Caffeine and Synephrine, to let you experience the intensity and rush you are looking for...but there is more! DMAE (dimethylamioethanol bitartrate) and Huperzine A have been added to this incredible formula to also activate neurotransmitter activity so that you achieve tunnel-vision focus! Bull Dose Rush has been formulated without any artificial flavors or colors. 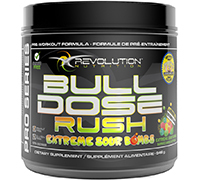 Bull Dose Rush is part of Revolution Nutrition™’s exclusive Flavor Match system. This system allows you to mix and match your favorite Revolution Nutrition™ products together in the same shaker bottle according to the flavor of your choice! You can thus add Bull Dose Rush to Whey Isolate Splash™, BCAA Splash™, Carnitine Cooler™, Whey Gainer Punch™, Whey Protein Punch™ and more! Mix ½ scoop of Bull Dose Rush with 275 ml of water immediately before consumption. Drink prior to your workout. 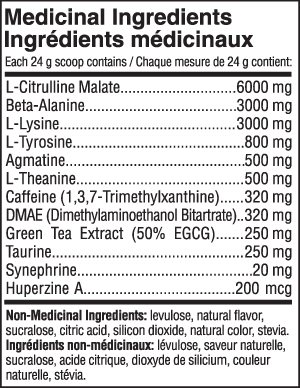 Do not exceed ½ scoop in any 24-hour period.